Congress Created the EB-5 program in 1990 to stimulate the US Economy through job creation and capital investment by foreign investors. It works by linking US businesses looking to raise capital with foreign investors who are seeking a US Visa, there by creating a “win- win” situation . This Program has also been called “Investors Immigrant Program”. A minimum investment amount of $500,000 USD or equivalent Currency is required . These funds have to be validate, must be an accredited investor. 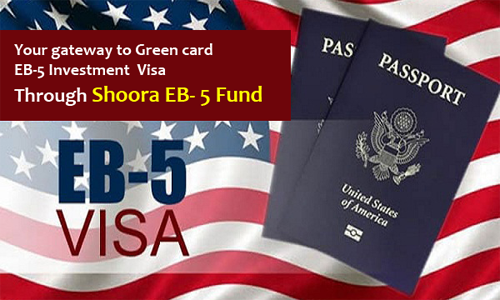 There are no minimum educational or English knowledge requirements for the green card under the EB-5 Program . The minimum age of primary applicant has to be 21 years, with no criminal records. Parents/Friends can gift $500,000 USD to their children for investment, too. Direct route to a Green Card and permanent residency in the U.S. for the investor and his/her immediate family (spouse & unmarried children under age 21). Access to the same high-quality healthcare as U.S. citizens. Free education in the United States public school system. No requirement for age, business experience,education, or English skills. No residency restrictions: participants may live,work, or retire anywhere in the United Sates. Investor deposits $500,000into a secure escrow account and pay legal fees only. No administrative Cost. This Website is for informational purposes only and is not intended as, and should not be taken as, financial, investment, legal or any other type of advice or as an offer to sell or a solicitation to buy any securities. The information contained in this Website includes projected results on this project that the project sponsor’s anticipated achieving as of the date that this Website was created based upon certain assumptions that are not included in this Website. The project and its affiliates and sponsors cannot and does not represent or guarantee (i) that the information contained in this Website is accurate or that any person or entity will achieve the results depicted herein in the future or (ii) the future results or success of any projects, investments or other matters involving the project. This information should not be relied upon in any way for any purpose. NO OFFER TO SELL ANY SECURITY IS MADE BY THIS WEBSITE.